Situated in the upmarket town of Solihull voco St.John's Solihull is ideally located in the town centre and is within easy reach from Birmingham International airport (BHX) & train station both just 5 miles away. Easily accessible from the M5, M6, M1, M42 and M40 motorway networks. The NEC and Resorts World complex are both located 5 miles away from the hotel for guests to visit for both trade exhibitions or leisure fayres and a great selection of concert dates to please all tastes. The newly opened Legoland is great to occupy the children, Touchwood shopping centre in the town centre of Solihull. There’s plentiful on-site parking and the town centre is just minutes away. The St Johns Hotel is ideal for business or pleasure with its distinctive approach to all guests and visitors. Offering 180 bedrooms including 2 junior,2 king suites and 14 superior rooms. Experience our excellent leisure facilities with indoor swimming pool, sauna & gym facilities which include everything you need to energise your day from modern weight and cardio equipment to personal trainers to guide you through your workout. Enjoy a drink in our bar or dine in the restaurant which will provide a perfect back drop to help you relax and unwind whilst savouring the seasonal specialties. With complimentary Wi-Fi throughout, the hotel makes a great business venue, with 13 dedicated meeting, conference and function rooms. 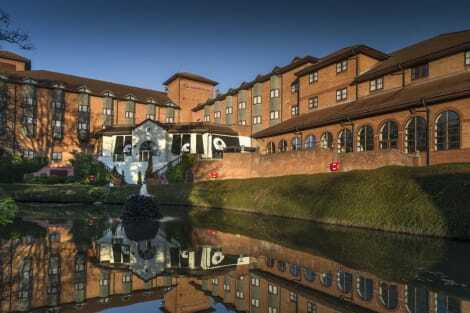 A luxurious lakeside hotel near the NEC with restaurant, Fitness Centre and a poolThe Crowne Plaza® Solihull hotel lies in quiet, leafy grounds in Solihull town centre, just off the M42 motorway. It’s a 12-minute drive to shows at the National Exhibition Centre (NEC) and concerts at the neighbouring Genting Arena. You can park the car in the large car park and walk 10 minutes to Solihull train station, for direct trains to London Marylebone and central Birmingham. Birmingham Airport (BHX) is just 4 miles away.The hotel’s 12 meeting rooms can cater for up to 200 people, with top-range AV including videoconferencing screens. The Business Centre has a PC and printer for guests’ use. WiFi is free throughout. The Crowne Plaza Meetings director ensure the event runs smoothly. The hotel is steps from Touchwood shopping complex housing stores, restaurants and multiplex cinema. Popular attractions like Cadbury World chocolate factory and Warwick Castle are just a short drive away. When you return, take a dip in the heated pool, work out at the well-equipped Fitness Centre and relax in the steam room. Relax in front of the TV, grab a bit to eat or catch up with work at the hotel lobby. You can savour breakfast, lunch or an evening steak at bright, contemporary Terrace restaurant. Sip cocktails at the glossy lounge bar or on the terrace overlooking lake in the hotel garden. At The Limes Country Lodge Hotel, enjoy a satisfying meal at the restaurant. Quench your thirst with your favorite drink at the bar/lounge. English breakfasts are available daily from 7:30 AM to 9 AM for a fee. Take in the views from a terrace and a garden and make use of amenities such as complimentary wireless Internet access. Additional amenities at this Beaux Arts hotel include concierge services and wedding services. Don't miss out on the many recreational opportunities, including an indoor pool, a spa tub, and a sauna. This hotel also features complimentary wireless Internet access, wedding services, and a television in a common area. With a stay at Gayton B&B in Solihull, you'll be a 5-minute drive from National Motorcycle Museum and 7 minutes from National Exhibition Centre (NEC). This bed & breakfast is 3 mi (4.8 km) from Resorts World Birmingham and 3.1 mi (5 km) from Genting Arena. Make yourself at home in one of the 3 individually decorated guestrooms. Wireless Internet access (surcharge) keeps you connected, and digital programming is available for your entertainment. Bathrooms have bathtubs and hair dryers. Conveniences include desks and coffee/tea makers. Located 15 minutes’ drive from Birmingham International Airport, Eden End Guest House provides free on-site parking and en suite rooms. A flat-screen TV with DVD player is featured in each Eden End room, as well as free Wi-Fi, an en suite bathroom with power shower, and tea/coffee making facilities. Breakfast is served in the cosy dining room, with yoghurts, cereals, fruit, or a full English breakfast. The National Exhibition Centre is a 10-minute drive, with Birmingham city centre only a further 10 minutes away. Shakespeare’s birthplace of Stratford-Upon-Avon is only 13 miles away, and features half-timber houses, shops and theatres. Located in Solihull, Broad Oaks B&B is within a 15-minute drive of National Exhibition Centre (NEC) and Resorts World Birmingham. This bed & breakfast is 7 mi (11.3 km) from Genting Arena and 7.2 mi (11.5 km) from The Mailbox. Named the best place to live in the UK in 2013, Solihull is a leafy, attractive and vibrant town surrounded by pretty countryside. Book one of our Solihull hotels and explore a town whose motto, urbs in rure – town in the country – tells you everything you need to know about its lively yet relaxed appeal. The town centre is excellent for shopping, with hundreds of designer boutiques and high street stores. The Mell Square shopping centre has more than 90 stores, and the Touchwood shopping centre has about the same number, as well as bars, restaurants, cafés and a cinema. Solihull's vast retail offering includes well over 100 independent businesses. Fashionistas will be pleased to discover the independent Bridge boutique and a branch of the tiny Aspire Style chain, which sells vintage-inspired clothing. The family run BB Boutique stocks organic children's clothes made by local designers. The National Motorcycle Museum is one of the largest motorcycle museums in the world, with more than 650 bikes on display, dating from 1898 to 2006. The Blue Ice Solihull Rink is open in the daytime at weekends and during school holidays, and every evening except Sunday and Monday. There are several discos each week, and a Friday session for parents with young children. The Tudor Grange Leisure Centre has a gym, three pools, including a learner pool, tennis courts, a dance studio, a sports hall, an all-weather pitch and an athletics track. The Malvern and Brueton Park has a nature reserve and woodland where you'll find oaks, giant redwoods, gingko biloba and Indian bean trees. There's also a play area, ornamental gardens, a lake and tennis courts. At Tudor Grange Park, next to the leisure centre, you'll find an 18-hole pitch and putt course, a skate park and a cycle track created by Olympic silver medallist Harry Reynolds. Solihull Arts Complex hosts both professional and amateur productions, including comedy, variety shows, concerts, children's shows, musicals, plays, dance performances and talks. It also runs workshops for adults and children, and more unusual events including yoga classes and tea dances. The 13th-century St Alphege Church is noted for its choral tradition and has four choirs. Evensong is held on Sundays, and the church hosts frequent performances by professional artists from across the country. Head to Giovanni's in Dickens Heath for authentic Italian food, or the Spice Club or Panchuli for a curry. The latter has some unusual options on the menu, including garam masala quails, salmon masor bhuna and a curry made from boiled egg, potatoes, chilli and turmeric. All three are TripAdvisor Certificate of Excellence winners. At Café Viola, an independent coffee shop in nearby Knowle, you can enjoy organic coffee, dozens of herbal teas, cakes, pastries and light lunches in pretty, stylish surroundings. Try the Turkish-Greek breakfast – or, if you want to sample a new dessert, the spinach cake.